This is a Hitchcock film and it even has an appearance by the man himself to make its point. I have seen this before but I was happily watching this with the lodger as villain until it finally occurred to me how unlikely that actually was. I thought the older actors were splendid particularly Marie Ault as the mother. Malcolm Keen lacked charm but even if he had been nice there is no way he could compete with the beautiful Ivor Novello. Some women back then really did like them the opposite of rugged. I can't bring myself to criticise acting and make up styles from 90 years ago. We happily accept Chinese opera or Kabuki without rolling our eyes at its outdated style so I don't mind Novello wearing as much make up as June. It is rightly lauded as making use of pure cinema techniques such as using a transparent floor to show the lodger's pacing but there are also clever bits like showing the light fittings swaying to illustrate the same idea - you can practically hear him. 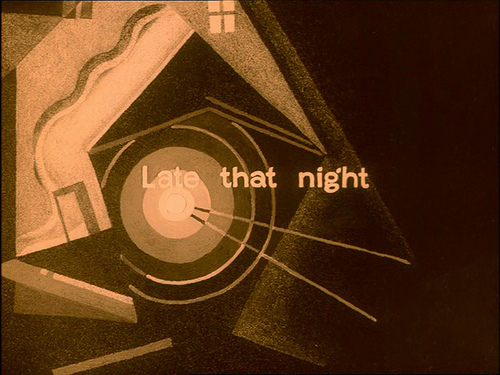 It was also beautifully designed with lovely tinting and (I wish they were in colour) intertitle designs by E. McKnight Kauffer. The only thing I don't like is the square in which several scenes were shot which was so unrealistic that it looked just like a stage set.